This building was constructed in 1920 to house a new milk-processing plant. It grew into a huge business in just a few years. By 1924, profits from the sale of high-quality milk, cream, butter, buttermilk, cottage cheese and ice cream were over $3 million dollars a year. The business employed 418 people and had 175 delivery routes that served over 50,000 customers a day. An early annual report described the creamery as "the most modern milk distributing plant in the Northwest." This successful business grew from the ideas of a few people. In September 1919, a group of workers tried to become members of the Milk Driver's Union, Local 471. An organization known as the Citizen's Alliance encouraged milk dealers to fear the idea of union drivers. A strike was called by one creamery, and other milk processing plants "locked out" workers. This meant that Minneapolis residents were unable to buy perishable dairy products for their families. Thirteen of the union milk drivers were angry that children had been deprived of milk during the strike. They decided to start their own creamery, and risked their savings to invest in this property. Permits for this building indicate that the foundation was laid in September 1920. Construction on the building was started the next month. 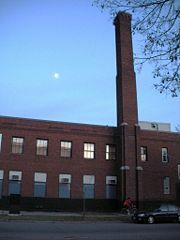 Within a few years the business had grown so much that a second, larger plant was added at 2108 Washington Avenue North. Success didn't change the original ideals or purpose of the cooperative. It limited the profits paid to members and was organized to put money into the community. 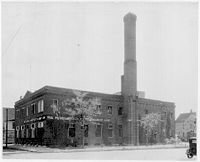 An early goal stated that the Franklin Cooperative Creamery was founded, owned and operated for the benefit of the people. The business emphasized good working conditions, an eight-hour day, and paid vacations for workers. It had laboratories to ensure product safety and quality, and invested in glass-lined delivery trucks and other new technology as soon as it became available. An early company slogan was "Cows with Conscience." In 1924 they established a medical clinic for children of employees and customers. They also paid the salary of a visiting nurse. During the Great Deperession, they changed the focus of their concern. The city was short of money to operate park programs. The Franklin Cooperative Creamery felt that healthy activities were as important as good nutrition. They teamed with the Minneapolis Park Board to sponsor 166 baseball teams. They provided uniforms, referees and trophies. They also supported basketball, hockey, ski-jumping events at Wirth Park, and the famous speed-skating races at Powderhorn Park. They also provided financial backing to school dramatic groups, to a program called Playground Circus, and to an employee chorus. They offered school tours of the plant that ended with samples of milk and ice cream, and used comic books and other advertising to promote the benefits of dairy products. In the years following World War II, refrigerators replaced ice boxes, and small neighborhood stores gave way to large supermarkets. People wanted convenience, and shopping habits changed. In 1960 the name of the business was changed to Franklin Creamery, and home delivery of milk ended. Not long after, the business that proudly called itself "A Good Neighbor to Minneapolis" closed. 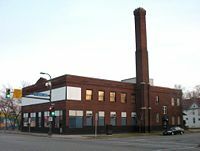 During the 1920s the Franklin Cooperative Creamery had a meeting hall in its North Minneapolis facility. The Swedish entertainers Gustav Fonandern and Lydia Hedberg each performed at the "Franklin Auditiorium" during their American tours.